I'm going to try something a bit different. I am going to spend a whole week devoted to one thing: Ice cream sandwiches. *Cue hand clapping and hootin and hollering* Well...one simple, delicious, divine, crowd pleasing ice cream sandwich in particular. I made this sandwich for a get together with my family a few weekend's ago- everyone was all smiles. Here's the thing though- in order to show you how to make this version from scratch (yes, completely from scratch) I'll need to break it up into three posts. Hence: Ice Cream Sandwich Week. I debated making this all one post, but then as I was going about it, it became more of a novel than a blog post. No one wants to grab their cup-o-Joe, sit down, and read a novel written by me first thing in the morning...not even my husband- and he's my biggest fan to date. So I decided it was a "no go" and that three separate blog posts would be the best. Also helping that decision was the fact that these three posts can actually be their own thing separate from each other, and don't need to only be in conjunction with "Making Ice Cream Sandwiches". But rest assured, once you have this down, you'll be an Ice Cream Sandwich making Queen!..or King! First things first- The Ice Cream. You can't have an Ice Cream Sandwich without the stuff. That's for sure! When conjuring up this delightful idea, I had a specific taste I was going for. Winter is almost gone, the sun has been shinning a lot more lately (we actually spent some time at the beach), and I'm desperately looking forward to the warmer months ahead. All this faux-summer talk had me dreaming about surf wax and sunscreen smells and tropical everythings. So for my ice cream I chose to make coconut. To me, nothing says "beachie tropical summer" like coconut. You, by all means do not have to make this particular flavor. Maybe you hate coconut...GASP! (hmmm...maybe we can't be friends...) Make whatever ice cream your heart desires. I love coconut...I even have a body spray scented like the stuff. I've been known to drench myself in it- instantly lifting any gross mood. It makes me uber happy, and that's a good thing. So welcome to Day 1 of Ice Cream Sandwich Week. Today class, we'll be making Ice Cream. 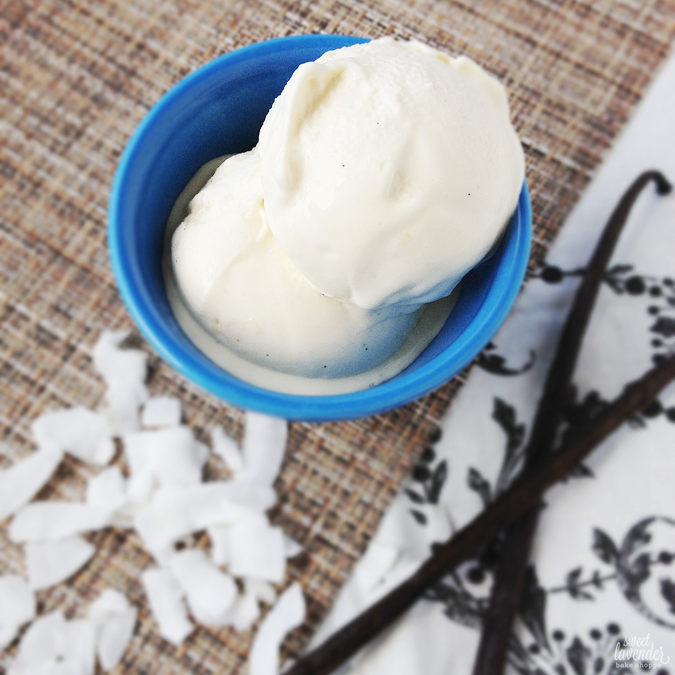 More specifically, Coconut Ice Cream...from scratch. 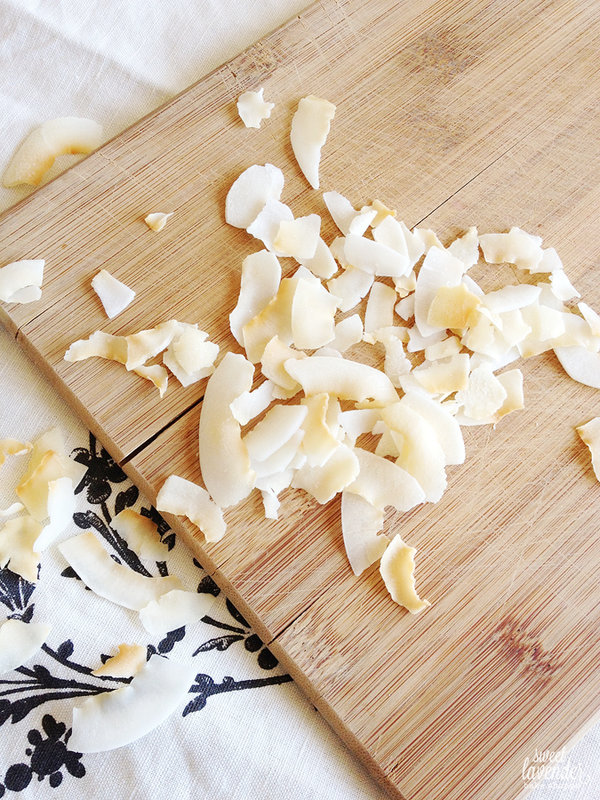 Preheat oven to 400*F. On an ungreased baking sheet, spread out coconut flakes in a single layer. Toast, in oven until lightly golden brown around the edges- about 5 minutes. Do not go anywhere! This will happen quickly. There's a lot of natural oils in the coconut which causes this crucial toasting to happen quick. I'm warning you- it does happen fast. As soon as you smell coconut, check your stuffs! Once toasted, remove from oven and let cool. You'll want to beat your yolks and sugar until you've reached the ribbon stage (light in color and fluffy/thick). Then you'll need to simmer your milk and vanilla bean over medium-low heat until just about to boil. Turn off heat and let steep 5 minutes. Make ice bath ;) Make sure your bowl that's sitting in ice water is big enough to hold ice cream base. Oh! And that it's glass or metal. Add fine mesh sieve to top. 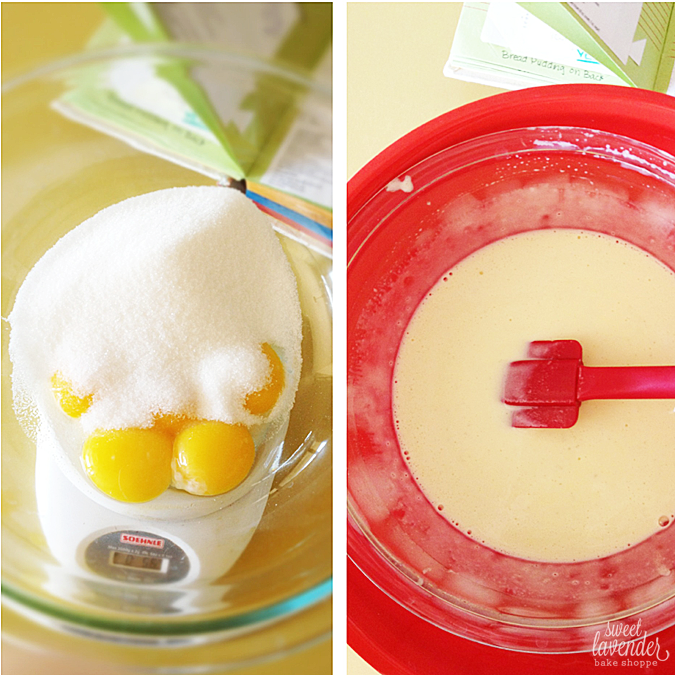 Temper milk SLOWLY into egg/sugar mix, whisking continuously. Once milk has all been incorporated, add back to pot. Cook, stirring CONSTANTLY over medium low heat until you've reached nappe' stage (or 180*F on a candy thermometer). This will take anywhere from 5-10 minutes. You'll know you're there when the mixture is starting to thicken, and it's coating the back of a wooden spoon heavily. For better pictures on what I mean, click here. Once you're at nappe' stage, take your pot off the heat and pour into your bowl in your ice bath, through the sieve. As you know, this is removing any egg shell or cooked egg that's maybe formed. Stir every couple of minutes and chill down your mix until no longer hot to the touch. Add your cream. Mix well and chill even more. Next add your coconut extract. For my taste, I used 1/4 teaspoon. Depending on the brand you have, and your taste- you might want to add more...or less. Start with a few drops, taste...add more, taste...add more...etc. You can always add...but you cannot take away. And remember- the flavor will lessen a bit once it's freezing cold, so you want your mix to be a little stronger than you would eat right then and there. 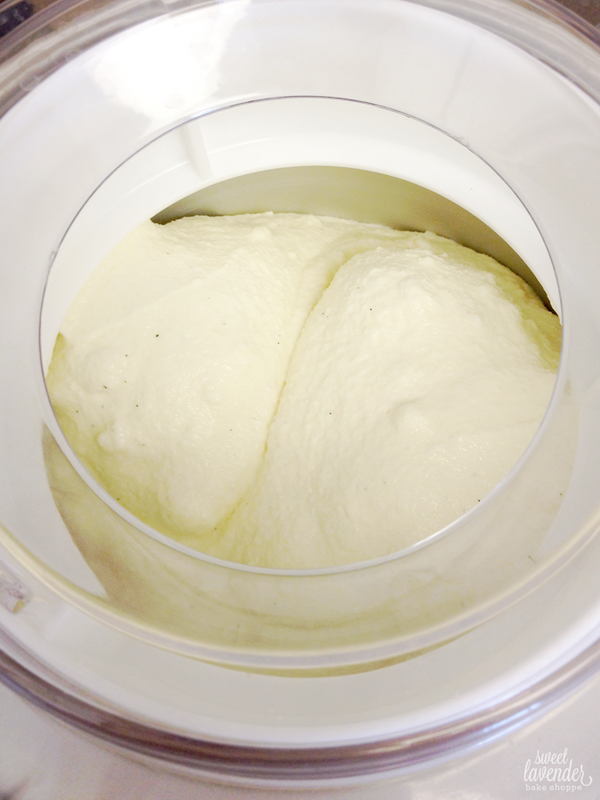 Now either chill over night (for best results), or if your mix is good and cold- add to your ice cream maker. Follow your maker's instructions. For my maker, this spun for about 25-30 minutes. When your ice cream looks fluffy, has increased in size, and is soft serve consistency (see above photo), it is time to add your toasted coconut. Add while maker is still going. I crunched mine up a bit in my hand before adding to ice cream maker. My flakes were kind of ginormous. If you're just wanting to make ice cream, YAY you're done!!!!! But if you're sticking with me for the long haul- see you next time for COOKIES!!! Ice Cream Sandwiches??? You are speaking MY love language!!! 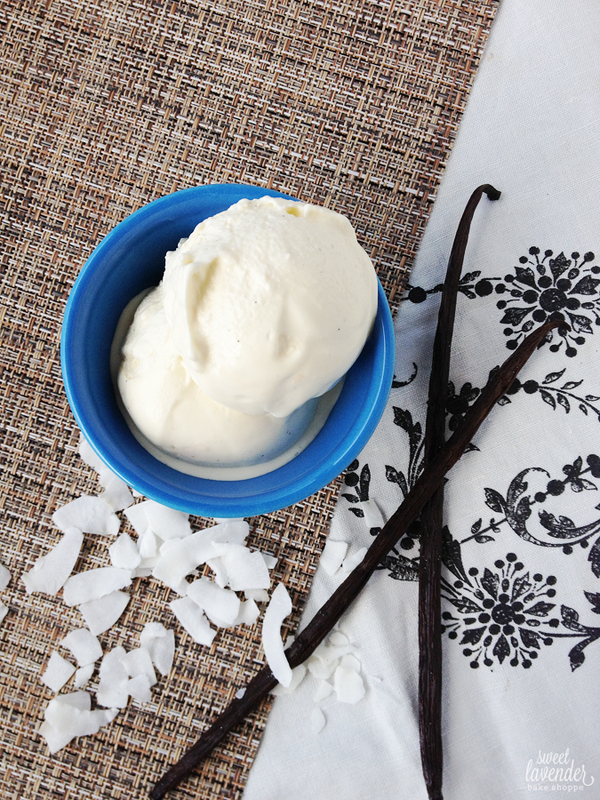 That coconut ice cream looks heavenly! Funny thing though, I really like coconut flavored and scented things. I just don't like coconut flakes? Is that weird? Go ahead and leave em out! Totally optional :) Stick around for a fun week!!!! Oh wow, this looks and sounds sooooo delicous and dreamy!! !